"The training you do for a big game is just doing training for a big mission." Several weeks ago, Alumni Football USA received an email from a guy who wanted to play in his high school's alumni game. We get these emails all the time, but this one was different. This one was from Afghanistan. This one was from Todd Belcher: Husband,Father, Soldier,and soon to be Alumni Football player. "I will be coming from Afghanistan to make it to the game. If that is going to be a problem...believe me, I am in way better shape than those boys." We alerted the team to really put some sweat into their practices, and eagerly found out more about Todd. "I am a Retired Navy Chief Petty Officer. I retired at 20 years and now I work for IBM as Site Lead for Intelligence, Reconnaissance, and Surveillance Task Force at Bagram Air Base (Bagram, Afghanistan)." Chief Belcher, his wife Sandra,daughter Taylor and sons, Trevor and Joseph. Todd was part of a Quick Reaction Company, and completed succesful deployments to Kuwait, Saudi Arabia, and Mogadishu, Somalia, in direct support of Operation Southern Watch. Chief Belcher completed the Army’s Survival, Evasion, Resistance, and Escape School and the Army Airborne School. While performing his duties as the Joint Fleet Telecommunication Watch Officer, he provided superior C4I support and instituted creative solutions to mitigate shortfalls in communication. His many contributions have significantly improved operational readiness and FIFTH Fleet Operations success. Todd has been deployed numerous times to Doha, Qatar and Baghdad, Iraq, and directly supported Operations IRAQI FREEDOM, ENDURING FREEDOM and the Global War on Terrorism.He also acted as Advisor of the Command Drug and Alcohol Program . His decorations include the Joint Servi Commendation (2 Gold Stars), Navy and Marine Corps Commendation Medal (1 Gold Star), the Navy and Marine Corps Achievement Medal (1 Gold Star), Combat Action Ribbon as well as multiple other medals and service ribbons. Recently Todd posted this comment: "Today is a good day to watch Saving Private Ryan...not just for the movie but people need to put themselves in the shoes of those men and what they was thinking right before the doors came down and then all hell broke loose. It is a crazy thing to put your life on the line for a bigger purpose than yourself." On May 19, 2012 Todd Belcher joined fellow Boone High School Alumni on the football battle field. He was honored, together with other heros past and present, with a 21 gun salute and presentation of colors. The final words of the National Anthem echoed through the stadium, and the hard hits began. Todd posted this status from the sidelines during the game: "No pain no gain.... Loving every minute." What was it like coming home to Jonesborough for this game? I always like coming back to Tennessee and seeing a Boone football game and looking at my old house and have memories of growing up flood my brain...then go to Daniel Boone HS and look at the football ball field and the track and remember running the stadium steps before summer practice and playing ball with my friends. It always take me back to when times were simple. I love my Tennessee roots and I am happy that I lived where I lived and grew up with the people that I know and stay in touch with 28 years after my graduation. My family and friends and fellow teammates help make me the man I am today. How did playing football prepare you for your future, and for war? I started playing football before I started school. I have always loved playing football. My father taught me that sports would help with working in groups and that concept has prepared me for life. You have to learn that your buddy is doing his job and if everyone is doing their job then you have a unified force. The same concept goes for the military. You always trust you buddy that he will have your six and take care of you while your taking care of him. The battle on the gridiron and the battle field are the same but different.The unity needs to be there for the team members. They have to know to trust their buddies but most of all trust their training.The training you do for a big game is just doing training for a big mission. On a balmy May evening in Jonesborough Tennessee, alongside his fellow Boone teammates,Todd went to war against archrival David Crockett High School. The battle field was grassy green instead of desert sand, and the men wore jerseys instead of camo, but the camaraderie was strong and victory sweet. Todd Belcher added the Legends of the Musket Bowl Musket to his long list of awards. Beaming, Todd announced: "I had a great time at Crockett and got the one that got away from me back in the day." At Alumni Football USA®, we love to get guys back on the football field. We also love getting warriors back to the field of life. There are a lot of warriors out there hiding behind big screens and underneath extra pounds, defeat, or apathy. We have a message for you: it’s time to step up, be a man, and get back in the game. Dwayne Cole did. He lost over 60 pounds and is in the best shape of his adult life. At 50 years old, he dreamed of playing just one more game. When he heard that his old high school, Daniel Boone, would play their archrival, David Crockett, this May in the Legends of the Musket Bowl, he put down the remote and picked up the weights- and hasn’t looked back. The moment Dwayne's foot hit the grass under the glow of the lights on game night, he'd already won. It didn't hurt that his team went on to beat their rivals 42-19. Boone took home the legendary Musket, and Cole walked away with the Oldest Player of the Game award. But neither were the biggest victory of the night. “I actually only knew one guy out of all of them, but they took me right in like we all had played together for years. Each and every one of them has changed my life in so many ways these past few months it's unreal.” Every guy who’s played full tackle football knows the sting of waking up the morning after the game. It’s a badge of honor and keeps the memories of great hits fresh. After a two day recovery period, number 66 was back at it: “It took until Tuesday to get back to normal and back to the gym-- I was pretty sore but not too bad for an old man. Got back to the gym yesterday and headed there this morning-- going to keep doing my work outs and stay in shape for next year. 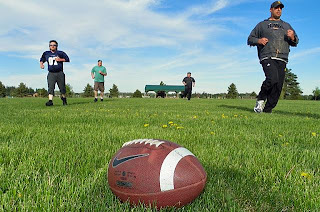 Looking forward to the game next year really helps you stay on track to want to get up and go work out.” Dwayne’s eyes are locked in on a new dream: Legends of the Musket Bowl 2013. “I am just as pumped up now for next year as I was 3 weeks ago for this game... in other words I am doing great ! !” After the lights were turned off, the popcorn swept from the bleachers, and the cleats hung up- the game is far from over. It lives on in Dwayne Cole. It woke up early this morning to go work out for the next big game. "It's one more opportunity to see if you’ve still got it” Josh challenges, “Instead of talking about it, go back out there and do it!" If you’ve ever played high school football, I’m sure you can imagine his response. For a high school football coach like Josh: “It would almost be blasphemy for me not to play.” Every guy who’s ever hung up the helmet for the last time knows that feeling-that urge to play again. For Josh Edens, the opportunity is irresistible. To say this guy has had a passion for football since childhood is an understatement. At age 7, Josh faced a difficult decision due to health complications. One option was a partial leg amputation. His one question for the doctor? “What will allow me to play ball?” Josh had the operation as soon as basketball season ended, and in three month’s time had learned to walk again with a prosthetic leg and was out on the field for spring baseball. This fearless determination carried him to a standout high school football career at David Crockett, where he made varsity squad as a freshman. He started all 3 years of high school, and saw Crockett through some of the winningest seasons in its history. A humble hero, Josh praises the value of teamwork on the field: “Football is the only sport where 10 guys can do their job and one guy can mess it up. The linebacker is in the trenches, you don’t see lineman’s stats, it is a personal one on one battle- you’re fighting for something, you’re blocking that guy, trying to beat that guy so that somebody else can get through that hole with the ball.” Edens played football in college with success, and went from playing to coaching, never missing a season. You're Never Too Young To Lead. "We came there as a team and we left as brothers." If you were at the Legends of the Musket Bowl Alumni Football USA game on May 19th, you may have overheard a kid in the bleachers ask: "Who is that man in the red shirt jumping up and down, throwing papers and screaming?" That would be Hayden Chandley, the 19 year old coach for the Boone Alumni team. We caught up with Coach Chandley after the game, to learn how a teenager led his old high school's alumni team to a 42-19 victory. How did you become the coach of the Boone alumni team? I talked with my former high school coach Drew Nelson about coming to watch practice and stuff. I was not playing in the game because I play football in college at UVA Wise. After a couple of practices, we got to talking about me helping out the team. One thing led to another and next thing I know, I'm calling in the plays during practice during game week while we were preparing for game situations. I know that God put me in the situation to coach this game for a reason, I know that He had His hand in all of this. It's not always about being vocal, but you can be a leader by leading by example. It's not always the most talented player or most vocal player. But when it comes down to crunch time, he is going to be there to make a play. How does age factor into being a good coach? It doesn't matter what age you are when you put the headsets on to lead your team on the field of battle. After 4 years of high school football and one year of college football, I feel like I am very gifted with a great knowledge of the game for anyone my age (19). I am not the most vocal, the strongest, or the fastest but a leader is one who shows heart and character when your team is battling adversity. I strive to do that. I know I would be nothing without my Lord and Savior Jesus Christ. This would also speak to why Tim Tebow is my hero and I look up to him more than words can express because of his love for the Lord. Favorite moment of the game? My favorite moment of the game, had to be when Dave Cox, a player who wasn't even dressed out when the game started,paid his money half way through the second quarter and came up with 2 huge interceptions for us during the game. That was just a classic. Watching the film, there is a fake punt that Crockett runs, I believe it was in the second quarter, and their punter started running forward before the snap and caught the ball 'on the run' so to speak. I went absolutely nuts. The referees did not call some type of penalty and I started jumping up and down, throwing my papers, yelling at the top of my lungs. Thankfully they were unsuccessful in their fake and we regained possession anyway. We won the game! It felt great and it makes my job easy when I got a group of guys like I had. Thanks to everybody. When you look at the team, what makes you proudest? The way we all, as men, came together in such little time. Guys from 19-50 years old, with me being the youngest. For guys more than twice my age to have enough respect and trust in me, and to believe in me to lead them on the field of battle to lead us to victory that night is just an amazing thing. They all trusted a 19 year old to actually know what he was talking about and to put the correct strategies and plays in, and to call them during the game at the correct time. Most of these guys had never met me before. We all had a special bond. We came there as a team and we left as brothers. Do you see coaching in your future? I have always wanted to coach. It just thrills me to lead a bunch of men playing one of the most amazing sports in all the world and trying to beat your opponent every night you suit up. I plan on majoring in education, getting a history degree and coaching football. Coaching is my dream, and I plan on making that dream a reality. He is not alone in believing this dream will be a reality. And Drew Nelson, the guy on the team who once coached Hayden? Referring to a heated moment during the game when Coach Chandley went past the numbers : "haha I thought of dragging him off the field but... he was into it let him coach! "